If you were hoping to see a casino heist picture like Ocean's Eleven with cool guys and smart suits, don't see this. This movie's opening frames feature fighting animated scorpions and it's obvious that we're in for some punk director's idea of a snazzy action film. No, there is no sense of clever in Graceland's casino heist. 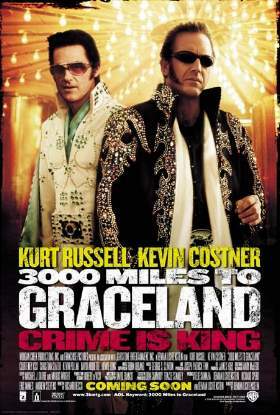 The movie is basicly guns guns guns, as Russell, Kevin Costner, and a band of thugs rob the Riviera casino in the midst of an Elvis impersonators' convention. Thirty minutes into the film, the heist is done, robbers Costner and Russell are off in different directions to fight over the cash, and Courteney Cox stands between them as a poor man's femme fatale. Who'll end up with the money? Who cares? We've got 90 long minutes to go, and we're talking downhill.